Garage door opener systems are complex electro-mechanical devices. During their lifespan, they can encounter a variety of issues. Our local experts will address malfunctions as they occur, potentially preventing future accidents. Garage door openers use one of 3 different drive systems; chain-drive, belt-drive or screw-drive. Chain drive systems are reliable, affordable but tend to be noisy. They are therefore a great choice for those prepared to compromise volume for price. For those willing to spend extra for silent operation, belt-drive models are a perfect fit. Screw-drive openers strike a balance between the two. They are a little noisy but don’t require much in the way of maintenance. Various major brand manufacturers offer different specialized opener features. 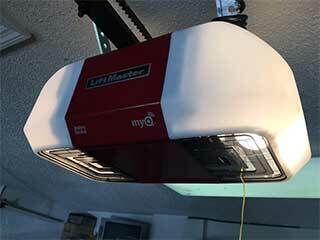 For instance, both LiftMaster and Genie utilize rolling code technology. This feature helps to prevent intruders from hacking your remote to gain your opener’s access codes. Each time you use the unit, the codes will change. In addition to this, you may also wish to consider other optional extras like WiFi compatibility and a backup battery system. Before deciding, consult one of our expert team. Regularly servicing your opener will help to keep it in optimum working order. When carrying out a service, our team will check everything from the motor gear and circuit board to the trolley and the rail. Should they discover something lacking, they will carry out any necessary, on-the-spot repairs or replacements to ensure that everything is in A1 condition. We will also test the unit’s photo-electric eyes and perform safety sensor realignment to ensure your door properly retracts should an obstacle block its path. For all opener-related needs, from maintenance and servicing to emergency repairs, contact our expert technicians at Garage Door Repair Fleming Island. Call us today!